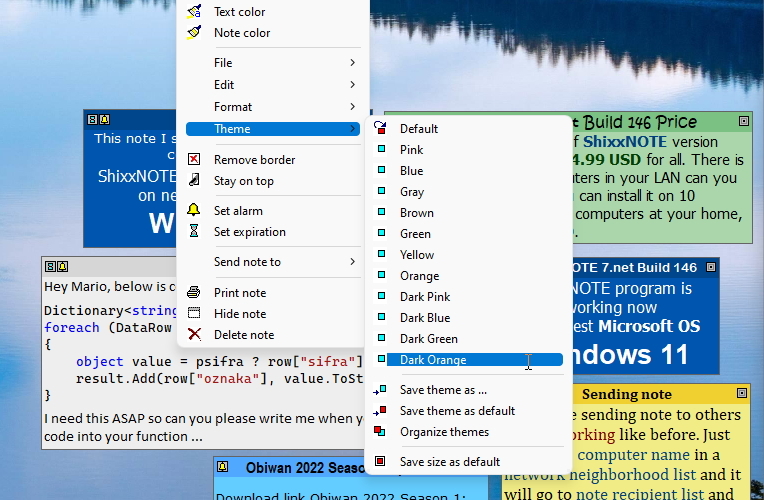 ShixxNOTE 6.net is a personal organizer, desktop sticky notes (post-it) program, instant messaging application (LAN messenger) and a communications tool used acrossa local network (Intranet), Internet and via email. Perfect and ideal tool for your LAN or office communication. Tired of losing your notes ? Want some help organizing your notes or just want to write something down quickly and you don't want to load a big word processor or PIM ? Need to send a quick note to a colleague, coworker or friend ? 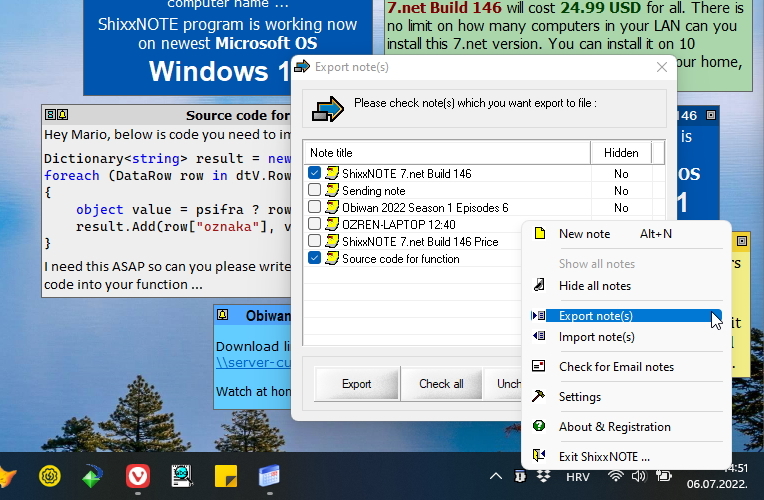 ShixxNOTE 6.net program is the most versatile and easy to use note taking utility there is for Windows 95/98/NT/XP/2K, Vista, Seven, 8.1 and Windows 10 as the latest Microsoft operating system. ShixxNOTE program is Windows 10 Compatible. ShixxNOTE 6.net is multithread client/server network tool that lets you display notes on your desktop and send them through your local network (LAN), Internet or via email to others. Easy to use personal info management application and powerful communication tool. It is configurable and stable. Program is also fully network and Internet capable. You can send desktop (post-it) sticky note right to the desktop of any other PC running ShixxNOTE, over a LAN, email or even the Internet. 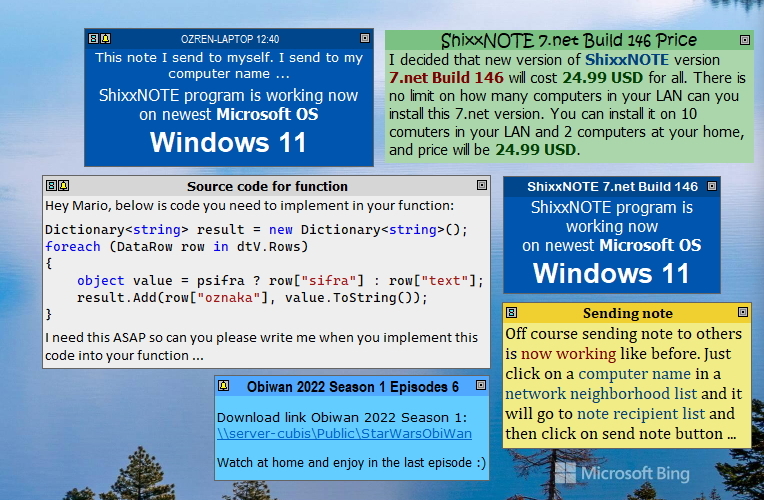 ShixxNOTE is a network enabled desktop sticky notes program and LAN messenger. It makes writing notes to your self or to your colleagues very easy and instant. 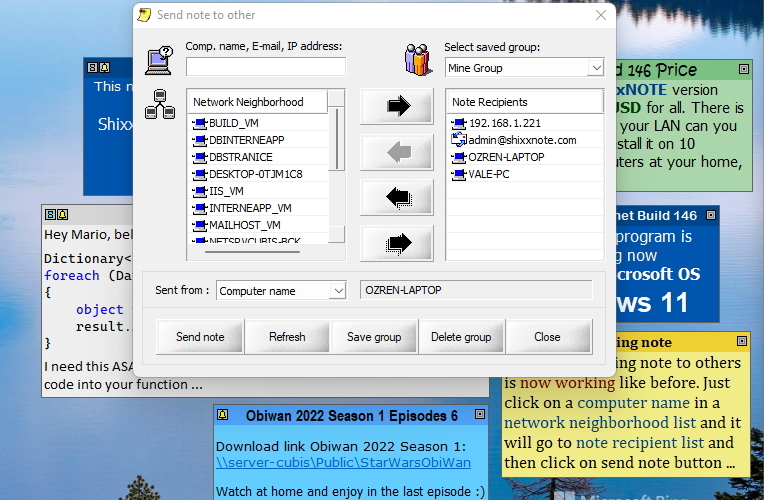 When you send note to other users, they will receive exactly the same note on their desktop if recipient have also program installed, otherwise program will use Windows Messaging service (NET SEND on Windows 2K/XP or WinPopup on Windows 9X/Me) to deliver message to recipient. It is powerful and most simple way to communicate with your colleagues on work or with your friends on the Internet. If you are having problem downloading setup file with Google Chrome check this article about warning message. After you succesfully download and start setup file you will maybe have expirience problems on Windows 10. Read more about this in this article about Windows 10 and "Program Compatibility Assistant". ShixxNOTE 6.net program resides in your system tray where a double-click automatically creates a new sticky note. A right-click on the tray icon opens the main menu. 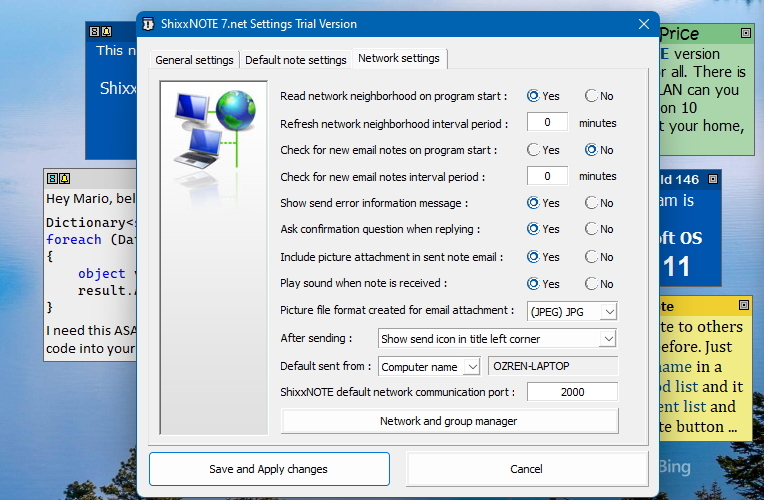 The ShixxNOTE 6.net main menu, accessible tray icon, provides access to configuration settings and other options. Right-clicking on a note brings up the note menu. From here you can change the display of your notes (for example, change the note color or font). Export, import, save as, alarm, expiration, paragraph settings, print and many other options and features can also be accessed from this menu. 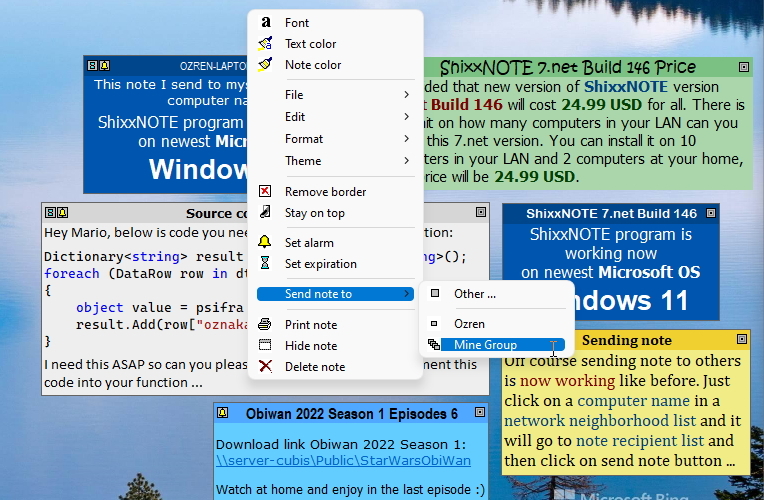 With "Send note to" option you can send a note directly to the desktop of any other PC(s) running ShixxNOTE 6.net program via a LAN, E-mail or the Internet - perfect tool for instant communication! 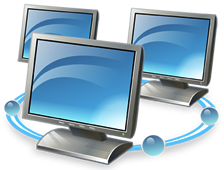 With two clicks you can send note to Group of users, for example to all computers in other office located in your building. Only "Windows 10 Compatible" software has passed tests for compatibility on devices running the Windows 10 operating system. "Windows 10 Compatible" products install without worry and run reliably with Windows 10. 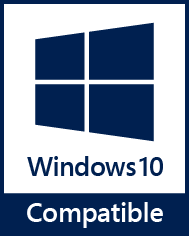 "Windows 10 Compatible" software • Is tested by you for compatibility on Windows 10. • Passed tests to minimize the possibility of crashes, hangs, and reboots. • Represents a commitment by you that the product will continue to work over the life of Windows 10. • Installs cleanly and reliably. • Eliminates unnecessary reboots. • Ensures compatibility with Windows 10, both 32-bit and 64-bit editions.